The energy business is prone to the silver bullet syndrome, a belief that a single solution can be found to solve issues, said Matthew Wald of the Nuclear Energy Institute. But good planners hedge their bets, Wald said in a Thursday talk in Kennewick that covered the role of nuclear energy in the nation's low-carbon future. 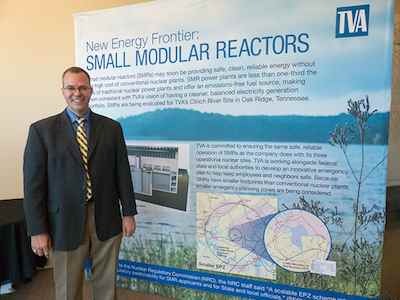 Wald spoke at Energy Northwest's Public Power Forum in his new role as the Nuclear Energy Institute's senior director for policy analysis and strategic planning. He's best known for writing about energy issues for most of the 38 years he worked at The New York Times. "The best approach to a low-carbon system is a diversified mix of emissions-free generators," he said. He spoke the same week that the Fort Calhoun nuclear power plant in Nebraska shut down after 43 years of production, although it was licensed to operate until 2033. Weak market conditions were blamed. Like Energy Northwest's Columbia Generating Station near Richland, the region's only nuclear power plant, Fort Calhoun was a single-unit plant, but with less than half of the production of the Washington plant. Fort Calhoun brought the number of U.S. nuclear power plants closing early in recent years to six. Seven more are scheduled to close. Together they account for 112 million megawatt-hours of carbon-free power, which is about 60 percent of all wind production, Wald said. Wind and solar electric production is increasing, and those sources are needed to meet the nation's carbon reduction goals. But instead of using them to replace coal and natural gas, they are helping squeeze out carbon-free nuclear power, he said. Storage issues and how to pay for storage of renewables remain unresolved. The issue is not so much how to capture renewables like solar during the day, to use when demand peaks as people are home in the evening, but how to use wind that may peak in December to cover demand for electricity that may peak in July, Wald said. "Because these are not in sync, you can get into a situation where each dollar that is added to renewable energy produces less and less usable energy," he said. Most of what replaces the output of nuclear plants is natural gas. When the San Onofre plants closed, the California state pollution regulators said carbon dioxide emissions increased by 9 million metric tons a year, Wald said. Natural gas is cheap and plentiful and easy to use, and may be for a few years to come, he said. But the sustainability of prices is uncertain, he said. Sooner or later, the nuclear capacity lost must be replaced, and when it is replaced with new gas-fired combined cycle capacity, consumers will pay more on a levelized cost basis than even the most costly nuclear plants, he said. Losing nuclear plants has both global and local impacts. "They are an anchor of the local economy," he said. Most are in rural areas, where the 400 to 700 jobs they provide are difficult to replace. And they typically pay salaries 36 percent higher than the average in the local area.